As a shy person, Sis. Felicia felt comfortable at that time as there were only very few Nalanda members and the atmosphere was family-like. After a few years of joining the weekly activities, she was approached to serve the Nalanda Committee in 2009, and she happily took up the challenge. Since then, Sis. Felicia has served as the Society’s Honorary Treasurer, and as a Treasury Team member. Apart from her easy-going quality, Sis. Felicia is undoubtedly humble and is always ready to render her services to others. Some of the important values gained during her service in Nalanda include being more confident, more open to other people, and always giving her best effort despite her busy schedule. Even though Sis. Felicia has been serving Nalanda for the past 10 years, the word ‘retirement’ is not in her dictionary! Sis. 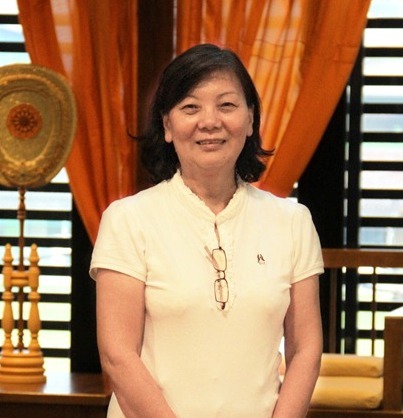 Felicia has shown unwavering perseverance and determination to serve the Buddha-Sasana through her continuous dedication and diligence at Nalanda. Sis. Felicia would like to take this opportunity to express her gratitude to all her Dhamma teachers, fellow Nalandians and most of all, to the Treasury Team for being her good friends. It is not surprising for us that Sis. Felicia is named an Exemplary Nalandian as she is indeed a role model for fellow Nalandians in terms of her humility, commitment to service, and also her cheerful character. We wish her all the best and may she be well and happy always!